In 1850 Edmund Hands lived at these premises and 11 years later, at the age of 70, ran it as a lodging house with his wife Patience. The property seems to have remained residential for a while but by 1875 George H. Palmer, the ironmonger was based here. Whether he ran it as a shop is uncertain but by 1881 he had moved to 27 Suffolk Parade. In that year a milliner named Elizabeth Wright was at number 32 and this trade continued here, later under Miss Strange, until about 1905. There followed another change when Mr M. Linton opened a newsagent and stationers at these premises from about 1915 to 1920 and then again with the arrivals of Madame Carter, Mrs Bennett & Miss Bamford, who were drapers and dressmakers. In about 1930 this became Mrs M.A. 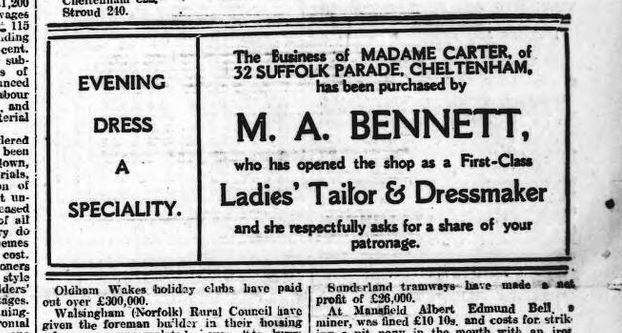 Batten's ladies outfitter and by 1935 Mrs Bennett's corset shop. She was here until the early 1950s and in the middle of that decade this was a shoe shop. By the mid 1960s there was another change and antiques were being sold here. In recent years this became an Indian and Bangladeshi takeaway food shop called first Curry Craze and then Spice Fusion.